On Wednesday, the Agency for Toxic Substances and Disease Registry (ATSDR) issued a revised report on what is known about environmental contaminants and human health in 26 Great Lakes Areas of Concern. This report responds to a request from the International Joint Commission (IJC) to define the threat to human health from critical pollutants found in the Great Lakes basin. The report analyzes many sources of data on environmental exposures and on human health in the Great Lakes basin. Key conclusions of the revised report include: 1) available environmental health data provide a useful but only a partial picture of the burden of chemical exposures people in the region face; 2) current health and environmental data collection cannot define the threat to human health from critical pollutants in the Great Lakes region; and 3) need for additional data collection and analysis to permit scientists, decision makers, and members of the public to define the threat to human health from pollutants in the Great Lakes basin. The report is available on the Internet at http://www.atsdr.cdc.gov/grtlakes/. The report is open for public comment for 60 days. 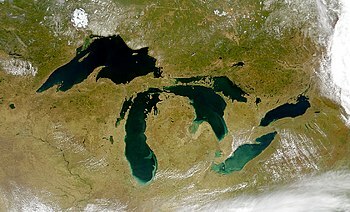 The Great Lakes are the largest system of fresh water lakes in the world and are shared by the United States and Canada. The Great Lakes make up 95% of the surface freshwater in the contiguous United States and have 10,000 miles of coastline–more than the contiguous United States, Pacific, and Atlantic coastlines combined. The lakes are a system of transport and shipping, as well as a place of recreation. Traffic on and around the lakes is currently threatening the lakes’ ecological stability. TORONTO, Can. — Lakes Michigan and Huron have permanently lost a foot of water because of erosion in the St. Clair River caused by dredging and other man-made meddling, according to a recently-released study. Water is permanently being sucked from Lakes Huron and Michigan because of ongoing erosion caused by dredging and other human activities in the St. Clair River — the drain that funnels water out of the lakes — according to a study. It is a sad state of affairs when there is such a disconnect between lifestyle and environmental consequences. It is way too easy to be more concerned with consumption of product that sustaining the conditions that made that product possible. The next generation of humans will inherit the results of mindless now thinking. Thinking that natural resources in infinite terms has allowed escalated destruction of those same resources. The education of American consumers stops at the cash register. Future students must step beyond the now and understand exactly what the natural cost of their purchases really are. Gathering, harvesting, processing, packaging, and transporting is only the beginning of the whole process. Then after consumption, there is the waste. Few can see beyond the trash can. The Great Lakes have become the trash can for the upper mid-west. The chemical and biological consequences of mixing countless pollutants and bio-matter is beyond comprehension. The simplest conclusion is that the best source for fresh drinking water is not only at risk, but that water is becoming hazardous. Water resources are taking more and more time and energy to treat and filter in order to make it useful again. Humans are made up of water. Water is important to all living things; in some organisms, up to 90 percent of their body weight comes from water. Up to 60 percent of the human body is water, the brain is composed of 70 percent water, and the lungs are nearly 90 percent water. About 83 percent of our blood is water, which helps digest our food, transport waste, and control body temperature. Each day humans must replace 2.4 litres of water, some through drinking and the rest taken by the body from the foods eaten.